Flaredance Firework Screensaver is flexible, detailed and hyper-realistic firework simulation software. It will operate as screensaver and will give you many hours of interesting and attractive animation. Depicted mathematic model simulates fireworks rocket explosions in most of the physical aspects, such as gravity, wind, air resistance, smokes, clouds and sounds. Clouds and smokes give additional realism to firework simulation. Each explosion or glowing sparkle lights up near clouds and smokes produced by previously flied sparks, stars and bombs. This effect gives more action and volume to animation and produces intricate play of light. Fast moving particles produce an effect called "motion blur." There are also glowing halos from especially bright particles. In addition, of course, there is great sound accompaniment composed from launch thunders, explosions and spitting sounds from sparkling bombs. We even simulated delays from distant explosions to reflect sound distribution delays. Look at screenshots we have taken during screensaver operation. You will find them at left side of this page. Click on screenshot image to open it at full scale in separate browser window. There are also two short animated previews showing screensaver operation in a small window. Another useful feature makes Flaredance Firework Screensaver not only pretty screen saving utility. Leave a text message when you are away from your computer. It will be shown when someone will try to close the screensaver by touching keyboard or mouse. Moreover, you can create application shortcuts for different messages to run the screensaver with a mouse click. 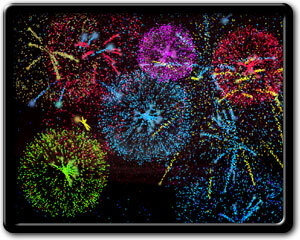 Flaredance Firework Screensaver fully supports multi-display computer configurations and wide range of hardware. It can operate in either OpenGL or DirectX mode. If you have two or more displays connected to your PC, the screensaver will allow you to configure resolution, color quality, refresh rate and even graphics engine for each display. Additionally, you can choose to display same or different models on your displays, which of the displays must be simply blanked during operation. The screensaver is capable to display amount of frames it produces, so called "FPS", and you can instruct it to show current date and time at screen top corner. To support wide range of system configurations, the Flaredance Firework Screensaver provides several settings for flexible performance control. You will be able to set desired frames-per-second parameter and overall animation complexity. Our firework screensaver uses open firework data format. You can use it to create your own fireworks with XML configuration files and exchange with them with us and other users of the Flaredance Firework Screensaver. You can download a free fully functional trial copy of the Flaredance Firework Screensaver for evaluation purposes. It is limited only by time of operation – you will have three weeks to evaluate it. If you like the screensaver, then you are expected to buy it. No additional download required, so you will be able to buy the key code online either via built-in order form or via secure web site. Ordering the Flaredance Firework Screensaver is fast, safe and risk free, because all orders are backed by our 30-day unconditional money-back guarantee. Your graphics card must support OpenGL while DirectX supporting is not obligatory. However, Flaredance Firework Screensaver in DirectX mode wins more frames-per-second while giving a picture of quality, similar to OpenGL-mode. To hear sounds from explosions you must have sound card installed on your system. We recommend using acoustic system with subwoofer to produce realistic and impressive sound accompaniment to action going on your screen during operation. We recommend using DirectX 9.0 or newer. Your graphics card must be OpenGL-compatible and OpenGL drivers for your card should be properly installed.